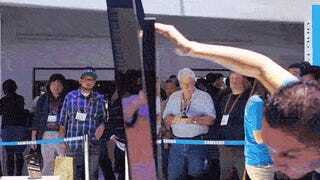 Samsung's S9, an ineffably beautiful television trapped in a massive, metal pillory, might be both the best and worst thing at CES 2013—it's certainly the strangest. It's amazing, terrifying, futuristic, barbaric, and almost gloats that you'll never own it. This TV hates you. It wants you to hate it back. And that's totally wonderful in its own unfortunate way. It's easy to resent this thing impulsively. None of the 4k, "Ultra HD" TVs on display at this year's show are anything resembling accessible. Almost none of them have price tags, or any indication of when they'll actually be a thing you can buy. But the S9 takes this unicorn status further than anything else of its kind—it's an 85-inch TV (something you probably can't fit in your living room to begin with) surrounded by an enormous metal frame. Every year prior to this, Samsung has shrunk its TV bezels into a wee sliver. Not this year, dummies—this year you're getting a bezel that has an even larger bezel latched onto it, criss-crossing chrome and black, clashing with everything in its vicinity. But there's a reason everyone at the show is crowded around this thing, snapping pictures on their phones to share with far flung friends in awed silence. As bizarre as the S9 looks, it's one of the only products unveiled this week that dares to look anything but plain. It's not another rectangle that essentially looks like the same rectangles from a decade ago. Once you get over the shock, you begin to love it in spite of its grotesqueness. It's grand. And we could use some grandness in gadgets, after we've pared them down to black boxes that are so similar, their makers get confused and angry and sue each other. We've been buying invisible gadgets, praised for how much they won't be noticed. Disappearing bezels, computers that are thin in places that don't matter, phones so light they've made my wrists frail. The S9 says to hell with all that: Ultra HDTV is going to be a terrific new thing to stimulate your brain with, and dammit, this TV is going to scream that at you. The S9 is physically jarring in a way that matches the intricate tech packed inside—a TV that has four times the resolution and four times the presence. This thing won't go quietly. It looks like the work of a madman, appropriate for a deep space villain's war room, but it's also a break from the HERE'S ANOTHER NEW THING LIKE THE LAST THING routine we see at the show each year. And I love that. CES is a spectacle, and it owes us a spectacle in turn. 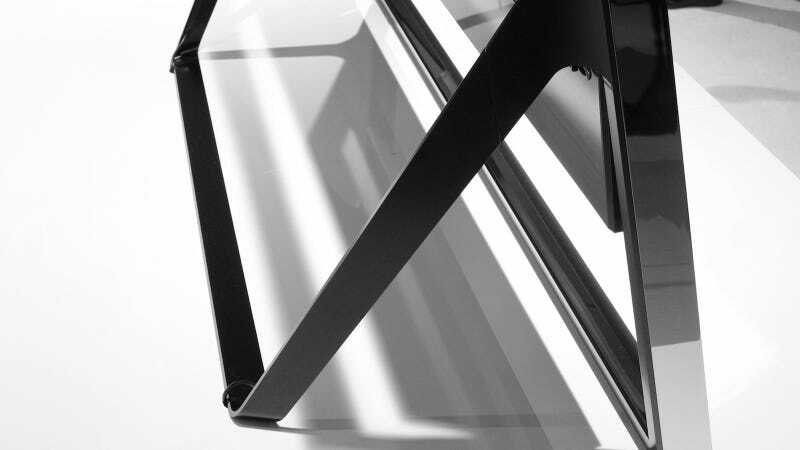 The S9 is that spectacle. Gaudy, sure, but we're in need of a gadget that drums up feeling and feels like an event. Bad feelings count. The S9 is maniacal, but CES needs radicalism. Let's just think of it as performance art. And besides, you'll never own the thing anyway.